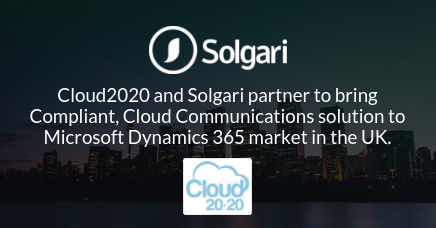 Cloud2020 and Solgari partner to bring Compliant, Cloud Communications solution to Microsoft Dynamics 365 market in the UK and across Europe. LONDON – 12th September 2018 –Solgari, the global provider of compliant, integrated omni-channel cloud communications services and Cloud2020, the fast growing UK Microsoft Dynamics 365 partner, today announced their partnership to bring Solgari services to Dynamics 365 customers in UK & Ireland. Solgari provides customers in 34 countries to date all the digital communication channels – including voice, WebRTC video, chat, IM & SMS – in the cloud, while automatically addressing local and international compliance requirements through a per user per month SaaS model. As a Microsoft ISV, Solgari, partners with the leading regional Microsoft partners who are developing transformational customer solutions on Microsoft’s industry leading Dynamics 365 platform. Cloud2020 has a highly impressive customer track record in delivering multiple cloud solutions across their key European markets. Opportunity to consolidate all communications on a single cloud solution for local and international offices. Achieve instant digital transformation, lower sales and support costs by offering customers & prospects easy to use modern communication channels including voice, SMS, WebRTC video and chat. Automatically address compliance requirements such GDPR, PCI DSS & MiFID II through recording & archiving all communication channels. Provide a single data view across all integrated communication channels which can be searched, retrieved and analysed in real time. Integration between Dynamics 365 and Solgari includes all the end to end digital communications, compliance, business intelligence and big data needs in the cloud. At least 50% cost savings with a per user per month SaaS model vs the alternative of multiple capital intense providers. Cloud2020 is a pure Microsoft Dynamics 365 partner, operating principally across UK and Ireland – we believe passionately in all the products offered across the Microsoft Cloud stack as they deliver the most comprehensive set of capabilities to support the range of organisations we work with. As a managed Microsoft partner, we are privileged to have a close relationship with the Dynamics 365 and Office 365 teams and are represented on key Microsoft development and product preview forums, meaning we have unrivalled access to the latest developments and leading support in the UK. As well as Microsoft, Cloud2020 has worked hard to build relationships with a range of strategic partners with market-leading solutions or services that run alongside our own offerings.